How Does Altitude Affect Vegetation? Elevation plays a large role in the health and growth of plants. Elevation may affect the type and amount of sunlight that plants receive, the amount of water that plants can absorb and the nutrients that are available in the soil. As a result, certain plants grow very well in high elevations, whereas others can only grow in middle or lower elevations. Plants in higher elevations can typically withstand colder climates. Plants in higher elevations typically receive more direct sunlight than plants of lower elevations. In addition, these plants receive a special type of sunlight, which has short-wave radiation. Whereas this poses an advantage for higher elevation plants because they receive more sunlight that they need to grow, it can also damage the plants if the short-wave radiation exceeds a certain amount. Lower elevation plants typically require less sunlight, and they are safer from many short-wave radiation waves, which do not reach farther down into lower elevation regions of Earth's surface. Plants in lower elevations are more affected by droughts, compared with plants of higher elevation. Higher elevation plants typically receive a lot of rainfall, which trickles down a mountain in the form of streams or rivers. However, recent climate change has dried up many streams and caused a lot of water to dissipate, instead of trickling down the mountainside. For example, in 2010, researchers at UC Davis found that plants at the base of the Siskiyou Mountains of Oregon were dramatically affected by recent climate change, which has reduced the amount of water available for low elevation plants. The nutrients in the soil are affected by both elevation and location. For example, in a recent study at the University of Nevada in Las Vegas, researchers analyzed the water and salt content of the soil at various elevations to study the way in which shrubs and small plants developed in the Mojave Desert. Their findings indicate that even the slightest change in elevation can yield significant differences in the kinds and health of vegetation in the area. Climate plays a large role in what types of vegetation can grow in a certain area. In higher altitudes, the wind and coldness become a large factor in vegetation development. 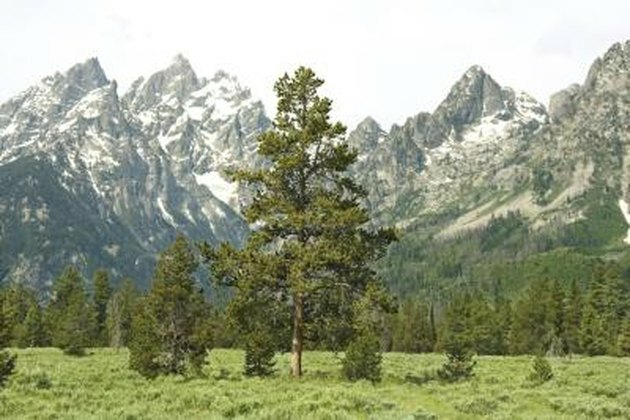 The United States Department of Agriculture outlines particular zones of high elevation in which plant life can withstand extremely low temperatures. The plants in these areas can withstand both freezing temperatures and a lot of direct sunlight throughout the day. John McDaniel attended Trinity College, where he published numerous articles in local newspapers and other publications. He has a history of publishing about arts and culture, as well as film, electronics, and social media. What Are Environmental Problems in Temperate Shrublands? What Type of Soil Does Alaska Have? What Type of Soil Does Arizona Have? What Plants Live in the Neritic Zone?